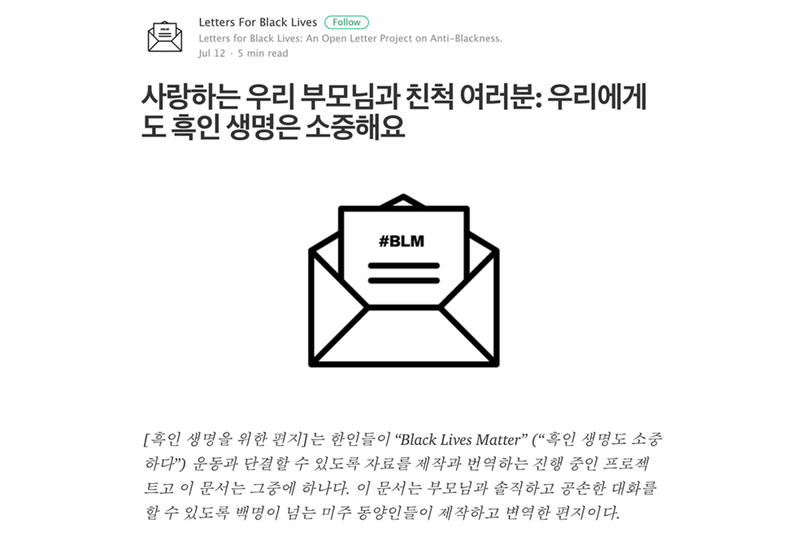 So begins an open letter that was drafted by hundreds of Asian Americans and addressed to their families to explain the importance of the Black Lives Matter movement. It was a crowd-sourced effort that took place in July completely online through a Google document, and the letter has so far been translated to over 20 languages including Korean. “I support the Black Lives Matter movement,” the letter reads. “Part of that support means speaking up when I see people in my community — or even my own family — say or do things that diminish the humanity of Black Americans in this country. The project was initially a response to early rumors that the officer who shot Philando Castile on July 6 in Minnesota might have been Asian American, raising concerns that the case could become divisive in the same way that the fatal 2014 shooting of Akai Gurley in New York by then-police officer Peter Liang divided Chinese Americans. For many first- and second-generation immigrants, the letter and its translations have served as a way to begin tough conversations on race with loved ones, especially in families where language barriers can make them especially difficult. In the accompanying note on the project, the contributors said that the project’s goal was “speaking empathetically, kindly, and earnestly to our elders about why Black lives matter to us. “We know first-hand that it can be difficult to find the words to talk about this complex issue, especially in the languages that resonate most with our elders,” the note reads. Jasmin N. Choi, a Boston University graduate student in social work who helped coordinate the Korean translation, said showing the letter to her parents helped begin an open conversation about police brutality and systemic racism. Before, she said such discussions were rare. Over 40 people helped translate the English letter to Korean alone. It was a daunting task, not least because of the sheer number of people involved. Just a few days after the call was made over social media for volunteers, there were already several versions of translated sentences made by different people that included varying nuances and context clues that might help Korean readers. Beyond phrases in English that might sound awkward in Korean, gender also presented a challenge. Many involved in the translation wanted to ensure that the writers would not be gendered in a binary way and that gender fluidity was acknowledged; however, this meant signing the document without using gender-specific words like “your son” or “your daughter,” the absence of which could seem impersonal to the Korean reader. There was also talk about whether to deviate from the original English letter and include references unique to the Korean American experience such as the civil unrest in Los Angeles that followed the police beating of Rodney King in 1992, known in Korean as 4.29, the date the event began. Many consider it a seminal moment in Korean American history, as its aftermath marked the formation of many activist organizations. The group ultimately decided to leave out details about 4.29, in part because the authors of the English letter wanted to keep all translations in the project consistent. Others added that the L.A. unrest was not necessarily an event that resonated with every Korean American, especially those who immigrated to the United States after 1992. Lee previously spent time working with Korean Americans in a majority-Black and Latinx[ref]“Latinx” is a gender-inclusive way of referring to people of Latin American descent. [/ref] housing project in New York City and having conversations with them about their neighbors. She was helping CAAAV, an Asian American grassroots community organization, produce a report on the lack of resources for residents, and part of the effort included going door-to-door and talking with Korean Americans who lived there. Lee recalled many of their concerns revolved around worries about crime in the development and not feeling safe. That meant shedding light on shared experiences living in the housing project, such as complaints about lack of repairs and safety. Lee recalled that many of the Korean Americans she spoke with expressed surprise when they discovered that many of their Black and Latinx neighbors had similar concerns. “It was just about creating an opportunity where people can question their assumptions again,” Lee said. For Kwon, talking with family about police brutality in communities of color meant connecting with their experience of state violence in Korea during the 1980s democratization movement. Choi said the group hopes to work on a second letter that speaks specifically to the Korean American experience and addresses topics that weren’t included in the translation, such as 4.29 and Korea’s history of colonization. She has already been in contact with another person who was involved in the first letter about possibly working on another. “I think it’s good to start the conversation, and I hope that other people will make [resources] that continue that conversation because I know it’s hard to throw [the letter] out there and not really have other materials that can help continue [the conversation],” Kwon said. Most of the people involved in the translation effort had never met each other before and only communicated online through the Google document’s comments tool. But ever since that project ended, some have met up in-person, and they say they’re excited to continue the process of building resources on Black Lives Matter.